Jewish motifs decorate the gold-painted glass medallions that were stolen by Nazis and restituted to the owners' heirs. Berlin (JTA) -- Israel has restituted three ancient "medallions" stolen by the Nazis in Poland in 1941. The heirs and an anonymous patron, however, are keeping two of the fourth century artworks at the Israel Museum in Jerusalem, where they have resided since their purchase from looters in 1965. 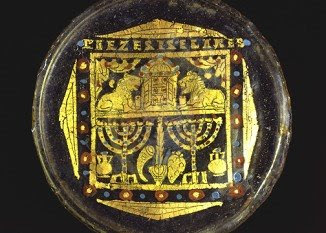 Jewish motifs, including menorahs and lions of Judah, decorate the gold-painted glass medallions, actually the bases of glass bowls. The medallions are among the oldest known depictions of Jewish symbols ever found in the Mediterranean Diaspora, according to Anne Webber, a co-chair of the London-based Commission for Looted Art in Europe. The nonprofit commission, which assists heirs in locating stolen objects and helps museums determine the provenance of their collections, announced Tuesday that the museum had restituted these three medallions to the heirs of their original owners. Webber told JTA in a telephone interview that the Israel Museum also acknowledged the items had been purchased from looters. She said the family wanted the items to remain in Israel because of their historical significance. In a statement, Count Adam Zamoyski, speaking for the heirs in London, said they were "very happy with the outcome." "We fully recognize the importance of the two glasses to the Jewish people and respect the wishes of the Israel Museum to keep them in Jerusalem," he said. Originally found in catacombs in Rome, the medallions belonged to a collection assembled by Countess Isabella Dzialynska (nee Czartoryska) at the Hotel Lambert, her family home in Paris. She later moved the collection to the family castle at Goluchow, and then to Warsaw for safekeeping before the outbreak of World War II. But the Nazis found and confiscated the collection, which Hitler moved to Castle Fischhorn in Zell am See in Austria in 1944. After the war, the collection was looted again, mostly by collectors from Austria. Two decades later, Teddy Kollek, the then-mayor of Jerusalem and founder of the Israel Museum, purchased two of the medallions from a collector in Vienna together with Israeli art dealer Joseph Steiglitz. Kollek bought the third one for himself and donated it to the museum in 1970. With help from the commission, the collection slowly is being reunited with its heirs. Earlier this year, a 13th century Limoges enamel cross was located in a collection in Zell am See and returned to the family. The family has known for four years that the medallions were in the Israel Museum. The two items bearing images of the Holy Ark, the lions of Judah and the Temple menorah will remain in the museum's permanent collection, the commission said. One was repurchased by the museum; the second was purchased by a museum patron for long-term loan. The eight-member commission of historians and attorneys has helped reunite some 3,000 stolen artworks and objects with their heirs over the past nine years, Webber said. "It is a drop in the ocean of stolen art," she added. Zamoyski says the family hopes to one day re-create the Dzialynska Collection in Poland.